I’ve really enjoyed sharing a weekly, “Things I Love Right Now” post with you. It’s been fun to share snapshots of life, of what I’m enjoying, and talking about the small things that make me smile. I hope you continue enjoying this series, too! Now that Theo is at preschool a few days a week, Oliver and I have been enjoying some much needed one-on-one time. 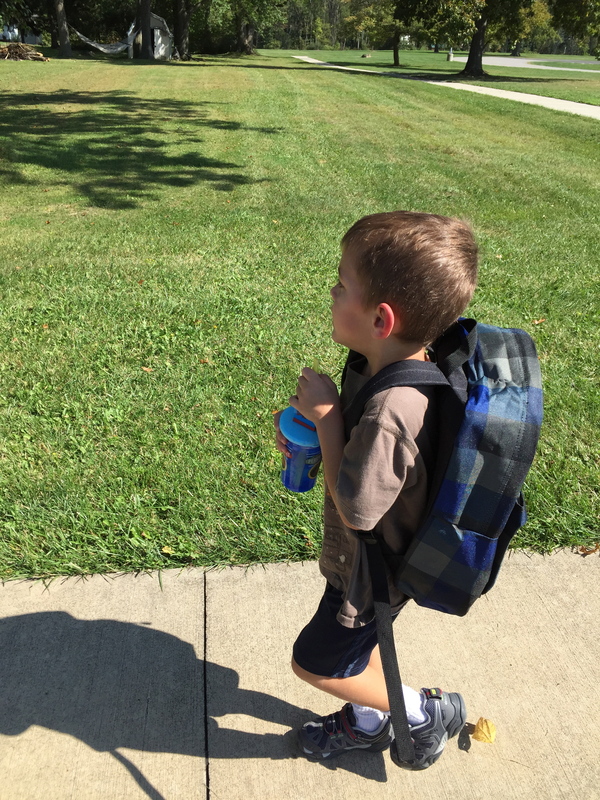 One of my favorite moments that we’ve shared, though, has been the few times we’ve walked to pick Theo up from school. 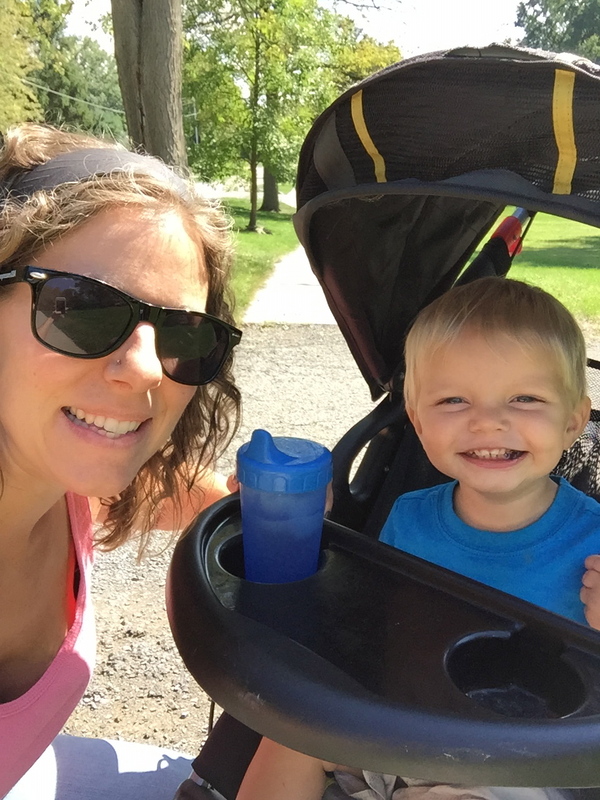 It’s fun to walk together, listening to Oliver chat happily in his stroller, as we enjoy being outside. The return trip is just as fun. I love seeing Theo run to us, excited about his day, and hearing whatever few details he is willing to share. He is playing things pretty close to the vest about preschool. He usually tells me that he loves school, that he had a lot of fun, and might even tell me what he had for a snack that day. But that’s preeetty much it. He has been pretty consistent in telling me that his teachers let him have juice, after which he gives me quite the smug little look. I gave him life, they give him juice. It’s all relative, I guess. Last week, our coffee pot bit the dust. That makes four in less than four years. I think this predicament is partially the result of our water, and partially (ok, mostly) overuse. They do their best, but it’s not easy to keep up with our level of coffee consumption. Anyways, so last week our latest pot died and I was a little frantic because a new pot was not in the budget. Then I went over to a friend’s house and she made me a delicious cup of coffee with her pour-over pot. Since I was already in the market for a new one, I asked her a few questions about how it worked and then set to work finding one. 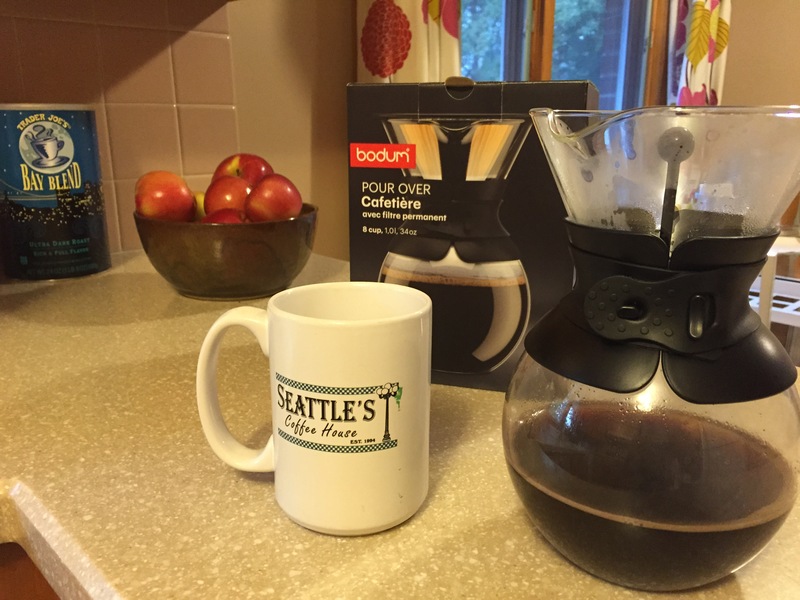 I found the same pot, Bodum brand, on Amazon and at Kohl’s for about the same price. I chose to go to Kohls because I didn’t think I could get one from Amazon within the hour and my coffee need was reaching a frenzied panic. I had a coupon that brought the total price to $31 out the door. I love this pot so much. I love not having a bulky coffee pot taking up space on my counter, and I appreciate the fact that you don’t have to plug it in. The one I purchased came with a reusable filter so I never have to buy filters, like, ever. Score! The pour-over method is quick, easy, and yields a smooth taste. I’m hooked! I’ve been throwing random things together to have on hand for snacks. 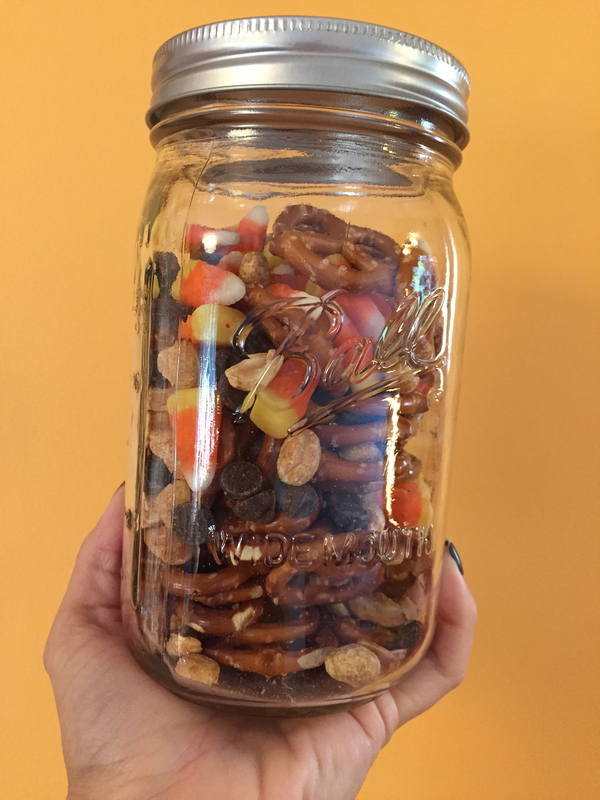 My family’s favorite combination so far has been: pretzels, salted peanuts, candy corn (duh), and dark chocolate chips. You’re welcome. The other day, I liked the outfit I put together and asked Theo to snap a photo. I should have been more…specific. Instead of waiting until I had taken my place, he took the picture as soon as I started walking away, lol. 🙂 Oh that boy makes me laugh so much. So last week, I posted 10 Things to Do This Fall. 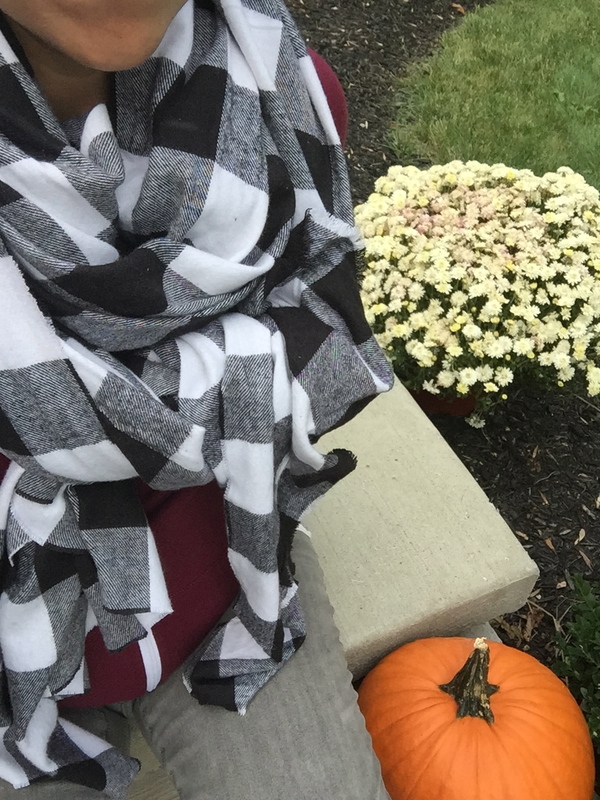 One of my suggestions was a project to make – a blanket scarf. I’m obsessed with these scarves. This project is really simple. Seriously. I have absolutely no patience to craft, and even I can do it. Jo-Ann Fabric’s has a ton of great flannels to choose from this time of year, and you can usually find a coupon on their app. I’m trying to resist going back to buy more fabric for additional scarves. I just love how full and wonderful they look! 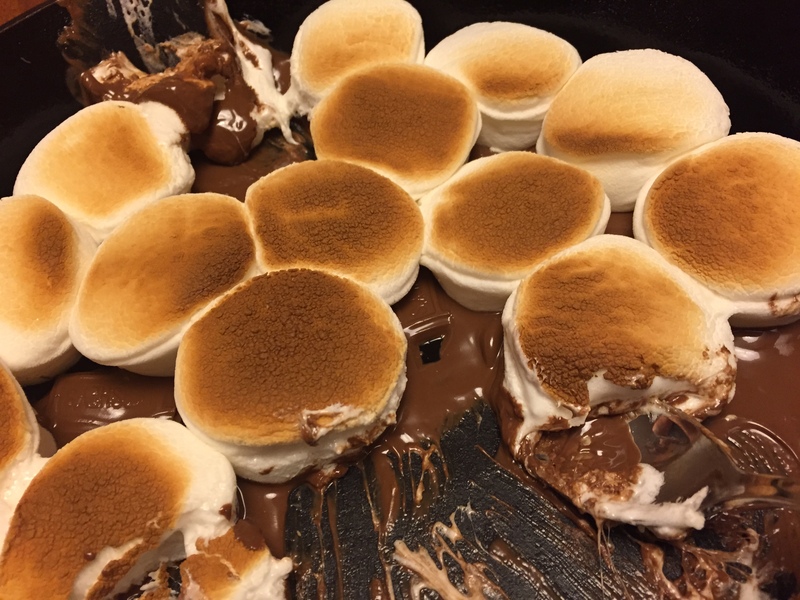 One of my go-to desserts for company these day is cast iron skillet s’mores. This dessert literally couldn’t be easier. It comes together in less than five minutes and is always a crowd pleaser. All you do is spread any type of chocolate chip of your choice (we usually use dark, but knock yourself out with white, peanut butter, semi-sweet, etc), top with marshmallows, and pop the whole thing under the broiler until the tops are browned. Then, just use your graham crackers as your dippers. Done! 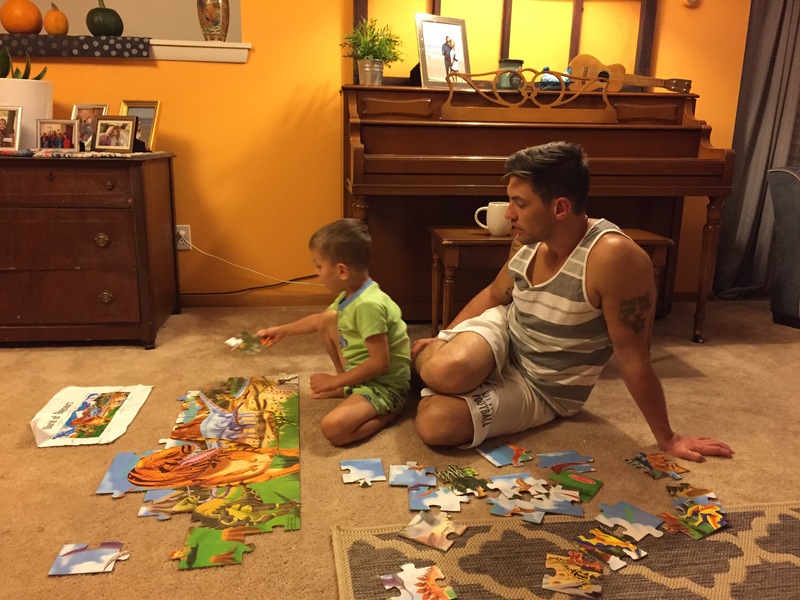 I found a Melissa & Doug dinosaur floor puzzle at at Thrift store for a $1 and it had all the pieces! I brought it home to Theo and it was an instant hit. Last week, Theo was in his room for naptime and was clearly not napping. I was feeling kinda miserable that day and was out on the couch, trying to nap myself, but instead lying there listening to what sounded like my son destroying his room. I was not wrong. When I eventually made my way back there, I discovered that he had broken one of the globes on his ceiling fan. 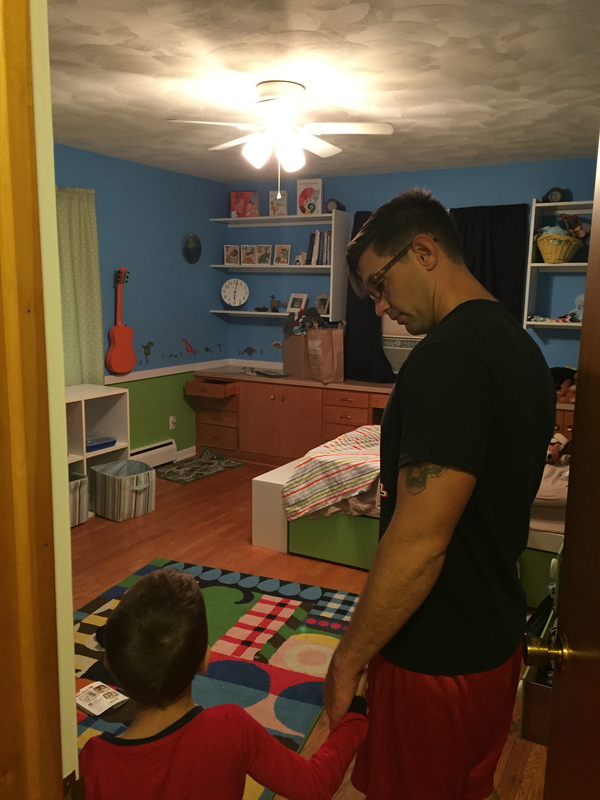 When Mike got home, I told him what had happened and we took Theo back to his room to discuss the broken globe. I’m happy to report that Theo was honest and fessed up to breaking the fan. I’m also proud for how Mike and I handled it. Neither one of us were mad. It is, after all, two little boys’ room. We both know that it’s important to teach the kids to respect property, especially when it’s others. But in this case, our little boy was just being a little boy. He had thrown a stuffed animal in the air and one thing led to another and soon both he and his brother were tossing toys back and forth. Ok, so I don’t love that we had to say goodbye to dear, dear friends of ours this week. But I do love so much about our goodbye. I love that it wasn’t really goodbye. I love that you can’t really say goodbye to friends who have become family. I love the memories that we’ve created over the years, and I love knowing that there will be more to come. 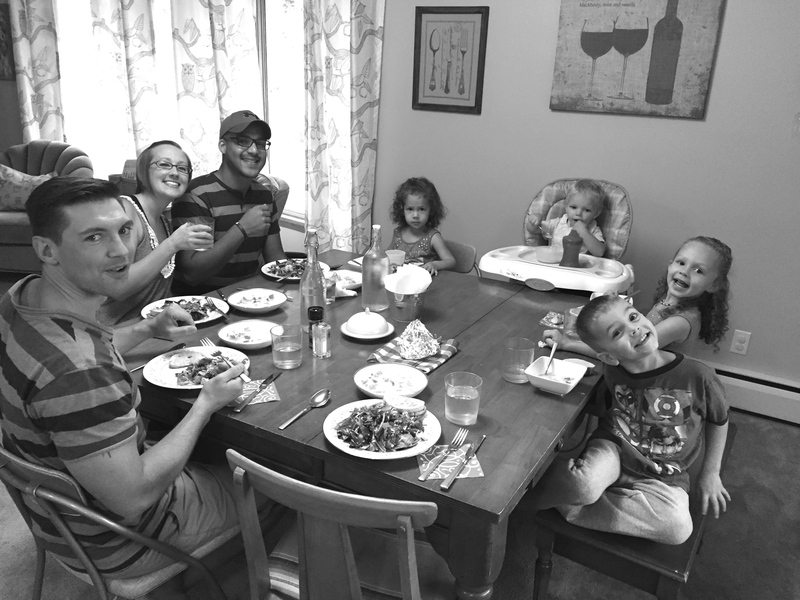 I love the meals we’ve shared around this table, and love knowing that they meant something. I love knowing that God brings people into your life at the precise moment that you need them the most. I love knowing that these special people are soon going to be walking into someone else’s life very soon, right when they need them. I love this family, and I love this moment with them. The goodbye part, well that sucked. But let’s just blame all the sobbing I did on my pregnancy hormones, k?